TVXQ just released a photo taken after their appearance on CulTwo’s radio show. Having recently made their comeback with their new title track ‘Something’, TVXQ appeared on SBS PowerFM’s ‘Two O’Clock Escape CulTwo Show’. 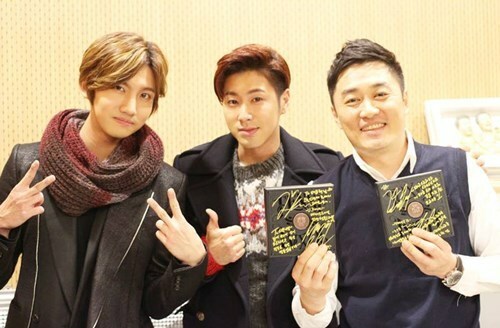 The photo shows Max Changmin, U-Know Yunho and Jeong Chang Woo standing in the radio studio as they pose for the camera. Max Changmin makes a ‘V’ with his fingers while U-Know Yunho gives a thumbs-up, with Jeong Chan Woo completing the photo with signed CDs in his hands.